I was an obese child! So heavy, that kids counted the rolls of fat around my stomach when we were on the beach and derisively called me “Tire Boy.” What led to my obesity, was that I mistakenly thought that my dad didn’t love or care about me. As a result of this profoundly painful misperception, every time that I felt rejected by my dad, and feelings of hurt, pain, rage, rejection, and unlovability filled my brain, heart, and psyche, I’d binge-eat. 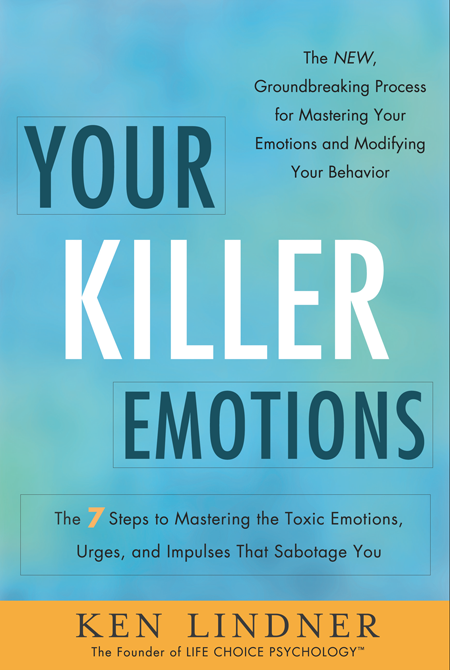 This was my highly toxic, emotion-triggered script, until I discovered The 7 Steps of Emotion Mastery, which appear in my new book, Your Killer Emotions: The 7 Steps to Mastering the Toxic Emotions That Sabotage You. One highly positive Step, was for me to identify my relevant Personal Emotional Triggers™ or PETS™, which are the things you love, want, hate, fear, etc. the very most. So, I identified that I wanted my dad’s love and approval more than anything else, and the way for me to secure them was for me to lose (a lot of) weight, so that I could be a good athlete and bond with my dad through playing paddleball and tennis with him. I also had a crush on a girl at school named Dale. I desperately wanted her to view me romantically, and not as the fat class clown; so this, once again, necessitated that I lose weight. Additionally, I very much wanted to fit into the cool, tapered jeans that other slim kids at school were wearing. Looking in the mirror at the new, slim, fit me! Since I discovered The 7 Steps of Emotion Mastery fifty years ago, I have been thin and fit; I’ve won national titles in two sports; and I’ve lived an active, athletic, and vital life. I have enjoyed all of these blessings, because I broke-up the toxic script of emotion-triggered eating! As we continue laying the groundwork for understanding and implementing my 7 Steps system, today we will discuss another fundamental component, Your Gold and Your Truth. First let’s take a look at what I refer to as Your Gold. Your Gold will encompass your most highly valued dreams and goals. It is what motivates you the very most to do your very best. Your Gold is most easily understood as the tangible things, positions, or goals that you want to attain. Next, let’s take a look at what I refer to as Your Truth. Your Truth is your vision of both the life you want most deeply for yourself and the person you most truly want to be. Your Truth is an idealized, or best, self. By identifying Your Gold and Your Truth, you will have identified what truly motivates, moves and excites you. You will then be able to harness and tap into the strongest energy charges available to you for a greater chance of success in making the best life choices for yourself. So, how do you go about finding your purest Gold and Truth? You have to go on a quest to mine them. What do I want deeply in life? What kinds of people do I want in my life? What makes me the angriest? What would my ideal life be like? What do I fear above all else? Once you have taken a deep, careful look within yourself and considered your hopes, dreams, fears, and shames, you will move on to creating some lists that will be your PETS™ (your Personal Emotional Triggers™). PETS are the topic of discussion in our next installment, so stay tuned! Your Killer Emotions reviewed by the Hollywood Hot Moms website on March 4th, 2013. Click here for the full review! Ken Lindner appeared on KCAL News at Noon in Los Angeles on January 17, 2013, to talk about his new book, Your Killer Emotions. Click here to see the full interview. Ken Lindner appeared on KTLA Morning News on January 20, 2013, to talk about his new book, Your Killer Emotions. Click here to see the full interview. Ken Lindner appeared on Access Hollywood Live on January 18, 2013, to talk about his new book, Your Killer Emotions. Click here to see the full interview. We are living in a climate of extreme manipulation. There are additives placed in our food to make it more addictive. Chemicals are put in our water. And marketing is flying at us to manipulate us at an unprecedented rate. Add to that the normal manipulation on the job or inside our family. When emotions take over, logic and reason disappear. Take the emotion out of any situation and better decisions get made. Kenny Lindner gives us real tools to make better decisions from that little piece of candy to big career moves and decisions that will affect our families for many generations. What would happen in our world if everyone took responsibility for ever aspect of his or her lives? We all know how profound the world could instantly be impacted. This is a groundbreaking book based upon decades of empirical experience of managing some of the most talented performers and steering their careers. Back Mr. Lindner’s experience with behavioral science and you get a potent prescription we all need to change our lives and perhaps the world. It is just that simple! We are affected by all the consequences of the decisions we make, big or small. Why not take responsibility for those decisions too? Reframing our decisions to understand those consequences is a great step toward taking responsibility. Century City is filled with consultants and we all know the first rule of consulting is to sow seeds of doubt and then make yourself indispensible. Consultants are all taught to constantly sell their “expert” status and then reinforce how important they are. But the truth is that those who really are experts don’t need to sell that hard. They make careers. They map out strategies and are worth their pound in flesh. One of those who has achieved “guru” status is now sharing with us his secrets for success. He has guided the careers of some of the most notable celebrities and he now gives us insight into how he has achieved superstar status in the most competitive of businesses… that of agenting. In the world of broadcast television he has eclipsed many of the larger agencies that have so much more going for them on paper. In spite of all their structural synergies they bring into the realm of broadcast television, Lindner seems to land many of the big fish as an independent and relatively small agency. Why? Because the advice he gives truly is sage advice. In his book, “Your Killer Emotions” he maps out much of the advice he has given for all of us pedestrians, that are not represented by him. In the companion book, “Crunch Time,” he taught us the eight foolproof steps to achieve our goals. This book, “Your Killer Emotions,” is the only voice I have found that frames the conversation in a way that we can all improve our lives by boiling down our choices to really comprehend the ramifications of even the smallest of decisions upon our life. What may seem like no big deal can turn into quite a big deal after years of having made even the simplest of choices. Consider the choice of eating fast food for every meal. “Supersize Me” was just about such a choice. You all remember the documentary film that opened our eyes to having three meals a day of fast food. The results were not pretty. So that tiny piece of candy we get from the bowl at the bank may not seem that harmful but when we make visits a number of times a day and numerous days throughout the week we are silently killing ourselves with something that seems so innocent. How about exposure to Radio Frequency? Or lawn chemicals? Or food additives? Or hormones? Or genetically modified foods? Or how about a toxic boss? A career choice? A marriage? Ken Lindner teaches us how to use our negative emotions to reframe our decisions into positive choices as we attempt to understand the true consequences of what we are deciding to do every day of our lives. Ken teaches us what he has been teaching his clients for years… not to be manipulated into doing something harmful. A client may have a contract dispute and that may turn ugly in order to manipulate behavior. By the studio making a continuation difficult they can avoid paying money they are contractually bound to pay. Ken frames the true choice by taking all of the emotion out of the decision and framing it with logic and reason. When we look at true facts and consequences the decision often becomes clear. I recently watched a very good friend and literary agent go through brain cancer. Seeing his struggles for the past three years and having recently said my “goodbyes” just prior to him passing away I have come to understand that brain cancer is something I never want to experience personally. By using Ken Lindner’s model I am able to reframe my choices of not wanting to suffer and to have those around me suffer and fix some of what is wrong with my life today… for a brighter tomorrow. From this “negative experience” of not wanting to die a slow and miserable death I have commences an exercise program and I have chosen much healthier salads over my normal fare of junk food. I have become an advocate of Ken Lindner’s self help books because of the profound changes they have made to my own life. My son met Ken briefly during the release of “Crunch Time.” A conversation between Ken and my son led to an action plan and goals as he agreed to read the book. He applied the 8 steps to achieve his Degree and ROTC training leading to lasting changes in his life. My son achieved “Cadet of the Year” in 2011 for the State of California and is currently in Jet Fighter Pilot School for the United States Air Force and he credits much of his success to getting on the right track from having read “Crunch Time” as well as his guidance from Kenny. “Your Killer Emotions” is in a category all by itself and I highly recommend the book to anyone who wants to get more out of his or her time on the planet. 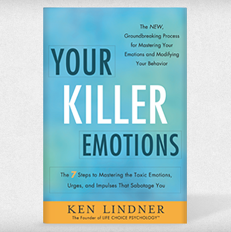 Click here to listen to Ken Lindner’s interview about his new book, Your Killer Emotions, with , with Kilmeade of Kilmeade & Friends on Fox News Radio.